Tau alumnus Clarence Walter “Walt” Schoenvogel, Jr. passed away on Sunday, July 23, at age 63. Walt was a successful businessman, community leader, and philanthropist, but he will be most remembered by his Kappa Sig brothers as a good man and loyal friend with a radiant personality. 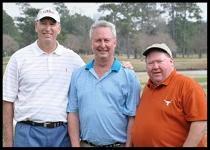 Walt loved golf and often played in the annual Tau Open and Cooley Tau Classic tournaments. In 2011, he, along with team mates John Eidman ’72 and Charlie Stoddard ’73, won the Denton Cooley Tau Classic in Houston. Walt gave generously to both the Tau 125 and Tau Legacy 2015 Capital Campaigns, giving more than $100,000 to each. A celebration of Walt’s life will be held Wednesday, July 26, 2017 at St. Paul’s Evangelical Lutheran Church in Brenham, TX at 10:30 A.M. The Tau Chapter expresses its deepest condolences to Walt’s family and friends.